I’m emailing you to make you aware of APLA’s latest initiative to force politicians to understand that they are allowing prospectors and small miners to be crippled by passing increasingly onerous laws across the whole spectrum of the West Australian mining industry. This escalating quagmire of regulations has to stop. This current campaign follows on from APLA’s successful campaign this time last that resulted in the Mining Legislation Amendment Bill 2015 being stopped in the Upper House of WA State Parliament. Big mining companies can cope with the bureaucratic burden and the financial demands from lobby groups and government whilst us small miners and prospectors are now walking away from the industry as it’s just too hard. Being APLA President, I attend all relevant meetings that affect us and take an interest in those that may affect us but to which we are not a party. I’m very much concerned that if prospectors don’t call politicians to account then you’ll be slowly forced out of the game by a bureaucracy that is ignorant of the damage they are doing to us. 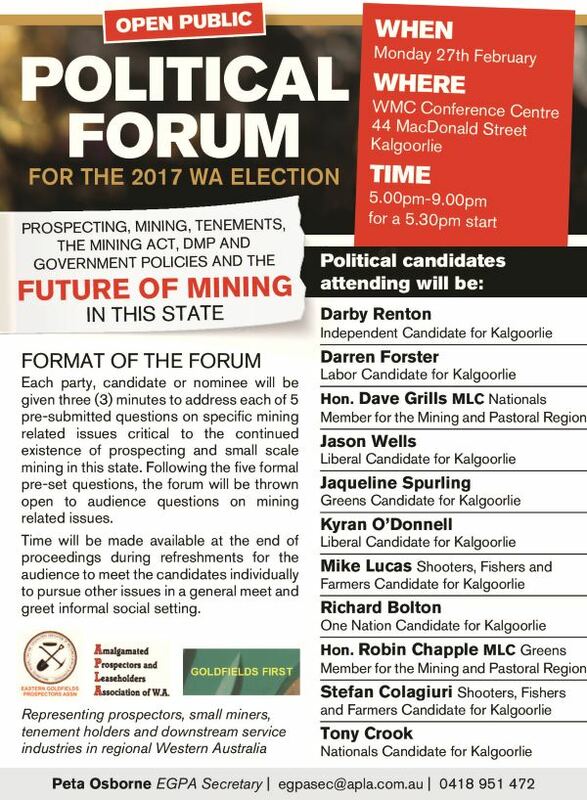 Please take the time to read our advertisement that will appear in the Kalgoorlie Miner and as far across the WA Goldfields as we can reach. As you can see the venue is in Kalgoorlie. We urge you to support us by being there. If you want to be there, please RSVP the undersigned on the email address below so we can arrange seating and catering numbers. I will pass these on to our branch in Kalgoorlie. Thanks for your time, your consideration and hopefully, your support. PO Box 2570 Boulder WA 6432."